So I am spending a bit of time revisiting patterns that I have made before – I know it fits, I know I like it and I can sew it up quickly, perfect projects for low energy winter weekends. 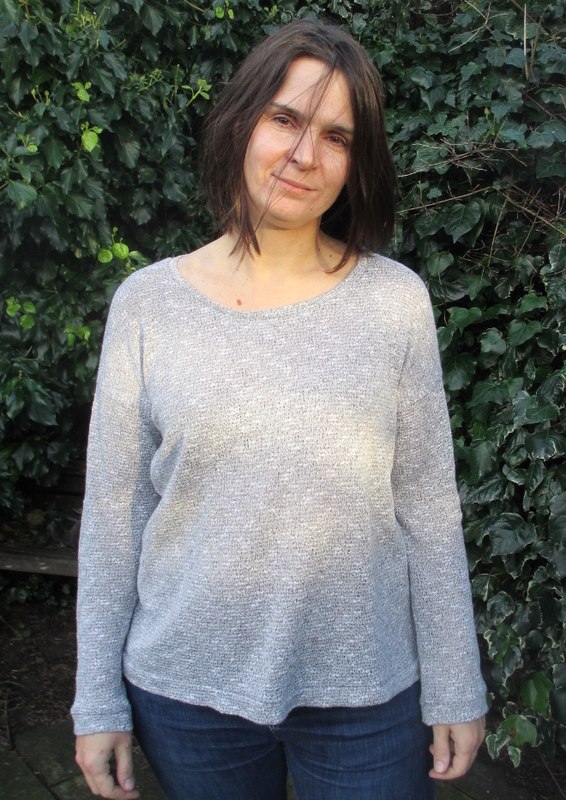 First up are these Grainline Hemlock tees – which I actually made a little while ago and have been wearing regularly. The Hemlock tee is a free pattern from Grainline Studio – you just need to subscribe to their newsletter. I have made the Hemlock tee before – here (one of the very first things I made) – a sleeveless version here – I have made a few others unblogged and one as a Mother’s Day gift. This is a perfect loose boxy top – I wear both of these new versions regularly, over jeans at weekends and with my Ultimate trousers during the week. 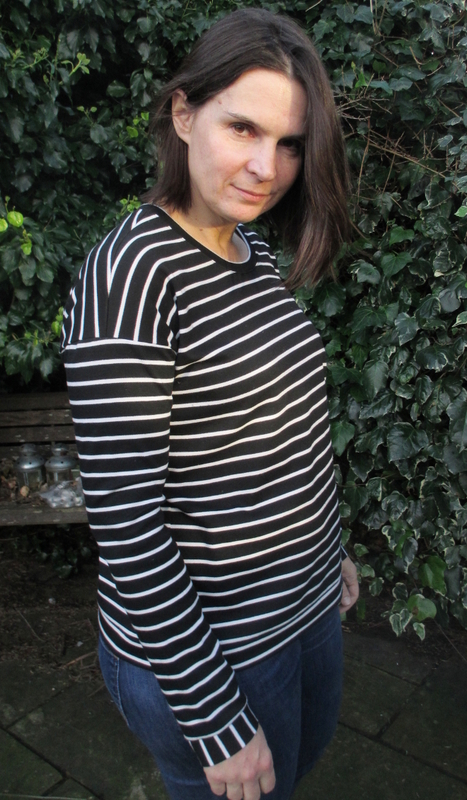 Version one is made from beautiful stripy ponte from Clothspot – sadly out of stock now – the fabric is thick enough to make a very cosy top. I briefly had a vision of a wide band at the waist with stripes running vertically, but when I pinned it on I didn’t like it, so I replaced it with a horizontal stripe band to neatly finish all the edges. 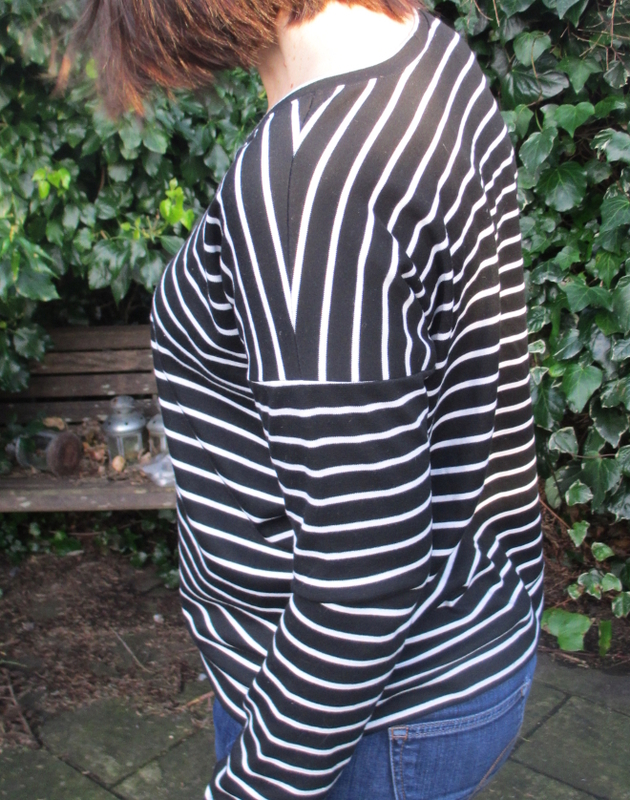 I did include wrist bands with the contrast stripe though and I am very pleased with the shoulder stripe matching! 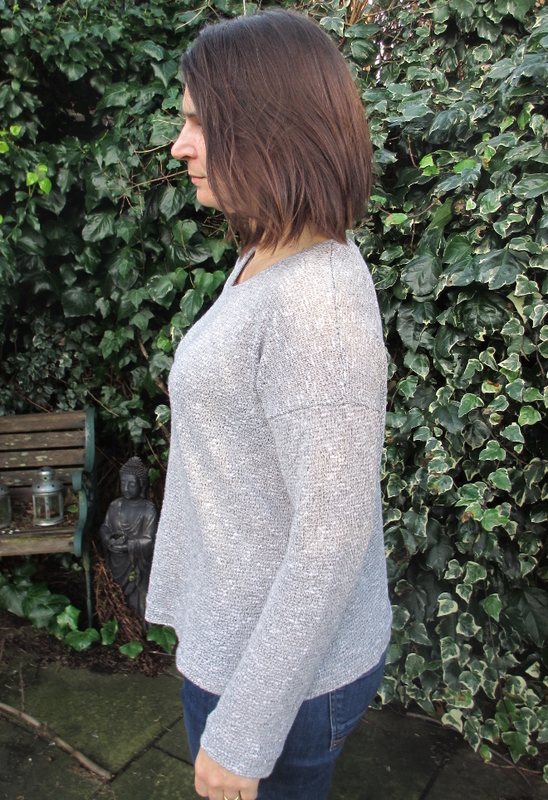 Version two is made from a lightweight, loose knitted silvery grey fabric that I found at Barry’s in Birmingham during SewBrum. I was worried that it could end up looking a bit like dishcloths sewn together and that the loose knit wouldn’t be very sturdy. I used my overlocker to sew all the seams and put bands on the wrists and waist to enclose all the raw edges and so far it has stood up well to washing and wearing. So I think I am starting to get back into the groove – I am sticking with TNT patterns for a bit longer so there will be a few more repeats to come, but I am looking forward to stocking up on wearable basics before I get started on new projects for spring and summer! And there were glimpses of the sun in the garden today so maybe I will even get some pictures of the new projects! Gotta love a TNT for when you don’t have the energy needed for something new. Love the grey one especially. Nice work. Thankyou – I just wanted to make some things that I knew I would wear and I could make quickly! Agree with Naomi above – TNTs are the comfort food of sewing😃. Its crazy but I didnt actually realise that this a free pattern! 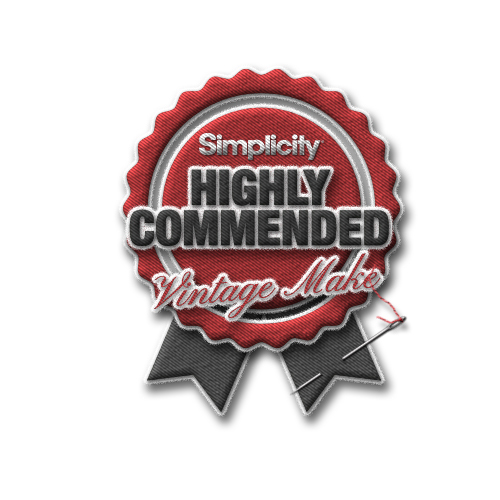 Thankyou – I love this pattern – definitely worth a go! These both look great! I’m in a sewing rut at the moment and I so agree with you that the thought of faffing around with the fit for a new pattern is just too much! I think I’m going to follow your lead and make a TNT and hopefully that will get me ‘back in the groove’! Thankyou! Look forward to seeing what you make! Yes I needed some easy projects after a bit of a slump! It seems there are several in a slump….must be the winter doldrums. These TNT shirts are very nice. Comfy, cosy, and yet they look very pulled together. They’re quite different, and I like both versions! They look great and so wearable! I really like the cuffs on the stripy one – a nice detail. 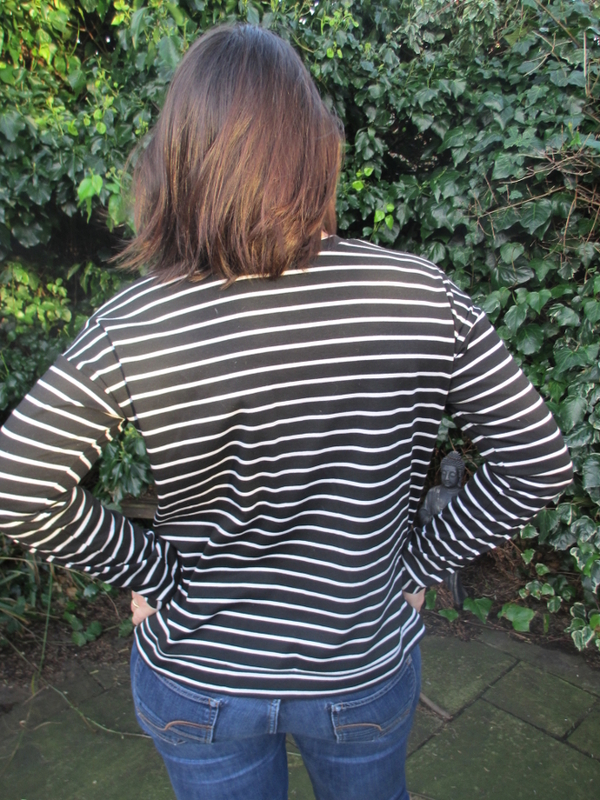 Thankyou – I do love the stripes! Those are perfect. I’ve needed to check out my drawer for T shirts for a while. They might be a bit old or grown out of. I’ll have to keep this pattern in mind when I replace them.